Discover the main landmarks of Salamanca, known as the golden city. 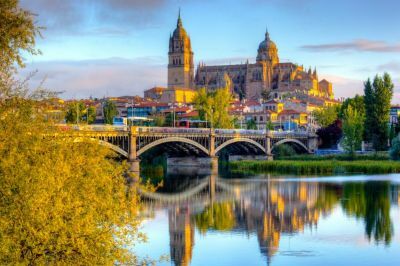 Known as Spain’s "golden city," Salamanca is rich in architectural, religious and gastronomic culture. Salamanca is in the central area of Spain, 212 kilometres from the capital, Madrid. Universal, magnificent, wise, young and golden: this city is an inland destination well worth discovering for many reasons. Its historic centre has been designated a World Heritage Site by the UNESCO. A centre for learning. Salamanca is the university city par excellence. Besides being one of the oldest in Europe, its university is also one of the country's best examples of Renaissance architecture. In its heyday it was one of the most highly regarded European universities. For this reason it has been attended by some of the greatest Spanish thinkers, artists and writers. In 2018 the University celebrated its 800th anniversary. The City of Spanish Language. In the 15th century, Salamanca saw the production of the first Grammar of the Castilian Language, which would become an essential tool for its expansion throughout the world. The city is also a favourite destination for foreign students wanting to learn Spanish. As you would expect, Salamanca is one of the most important stops on the Route of the Spanish Language. A historic crossroads. The Vía de la Plata (Silver Way), the old Roman road linking northern and southern Spain, passes through Salamanca. It is a good base for exploring interesting towns and villages nearby, also on the path of this ancient road, such as Guijuelo and Béjar. A meeting point. Its humanist tradition, its open, friendly local people, its cultural interests, the wealth of its heritage... These are just a few reasons why Salamanca was European Capital of Culture in 2002. A youthful spirit. Salamanca is rich in history, but it’s also modern, lively, and fun. Thanks to the students, this city is full of life and movement 24 hours a day. Meet your Private English-Speaking Chauffeur in the lobby of your hotel. We have reserved a table for you lunch after the tour at a recommended restaurant.